BushWok.com is located in Alice Springs, Central Australia and provides a range of outdoor catering/ nutrition/ team building/ entertainment products focussed on preparing and cooking healthy food, eating and promoting healthy cooking and nutrition practices. Our aim is to stimulate public health nutrition action through sharing healthy food preparation and cooking skills and techniques, and to inspire all of our clients to become cooking and nutrition ambassadors for better public health. This is achieved through promoting and promulgating an engaging outdoor community-focused program that teaches basic cooking skills and good nutrition to non-cooks in remote Australia, especially in rural and remote Aboriginal communities. Ultimately our aim is to improve Aboriginal people's quality of life and health through better nutrition. A BushWok© is an innovative cooking device designed for easy outdoor meal preparation. The cooking device utilises a Flour-Drum Stove which, when used in combination with a wok, is known collectively as a BushWok©. 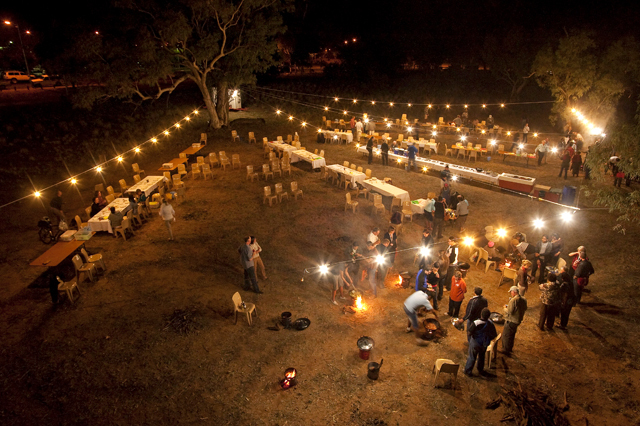 BushWok© Conference Dinners© are large scale facilitated cooking events conducted outdoors for groups 100 to 1000 pax. On the 28th July 2010, the SNAICC BushWok Conference Dinner was held across the road from the Alice Springs Convention Centre for the 850 delegates who attended the conference. Click here to see images of this highly rated event. Billed as "the most unique conference dinner you will ever experience in the middle of Australia", last years BushWok Conference Dinner organised was for the Hands Across The Desert Conference, held on the 12th August 2009 in open space opposite the Alice Springs Convention Centre. One happy participant at the BushWok Dinner was so impressed she wrote "Hi Roy, I just wanted to let you know that I had a great time at the conference dinner. You did such a great job. Everyone on my table had a ball. Thanks Roy. Nina". Click here to see images of this event. BushWok© Cooking Parties© are facilitated cooking events conducted outdoors for groups up to 50 people. BushWok travelled 1200kms from Alice Springs to Katherine NT to support the Fred Hollows Foundation to launch the Kukumbat Gudwan Daga Cookbook at Banatjarl, south of Katherine. Ladies at the launch cooked three dishes from the new cookbook in BushWoks for the evening meal. Organiser of the event, Alison Lorraine later wrote "Hi Roy, Thank you so much for your help. Everyone said that the BushWok cooking made the event!!! Lots of the media requests have utilised the photos of the ladies cooking in the BushWoks. Regards and thanks again, Alison". (read on). BushWok© Cooking Clubs© differ to cooking parties in that participant families contribute both financially to the costs of purchasing the meal ingredients as well as providing the labour to cook the meal, which is then shared. BushWok© Cooking Competitions© are facilitated competitive outdoor cooking events for groups of 50 to 100 people. Teams of three to five entrants compete with other teams, and prizes are awarded on presentation, other sensory (taste, aroma, texture, etc) and food safety criteria. Call me on 0409695949 to discuss BushWok© Cooking Competitions© successfully undertaken at the remote NT Aboriginal communities of Titjikala in 2008 and 2009, and at Santa Teresa, Areyonga, Wallace Rockhole in 2010, . BushWok© Outdoor Catering© provides simple catering to groups from 20 to 100 people in any setting (we are completely portable) including urban and distant remote. An example of a BushWok© Outdoor Catering© event occurred in September 2009 at Soapy Bore in the Utopia region via Alice Springs for a group of 12 Heart of Dreaming Conference delegates over 6 days. Click here for images of this event. BushWok© Catering Equipment© supplies the necessary hardware to easily prepare exciting meals outdoors with family and friends. BushWok© supplies drum-stoves ($20), woks (large $50, small - go visit KMart), wok lids ($20), spatulas ($10) and BushWok© Cookbooks (see below). BushWok© also provides a wok seasoning service ($10) to help get you started. BushWok© Nutrition Education Food Safety Education and Training© provides non-accredited life skills training to Aboriginal people living in remote locations to enable them to develop better individual and family well-being through making better use of the available food supply, acquiring healthy cooking skills, improved family nutrition, and safe food handling and storage. BushWok© Cookbook© with several easy to prepare mouth-watering recipes to cook while you are out camping. BushWok© Vegetarian Cookbook© is a collection of ovo-lacto classics from around the world guaranteed to transport you to complete gastronomic Nirvana. BushWok© Gourmet Camper Cookbook© provides a range of recipes for the discerning camper who will be satisfied with nothing other than haute cuisine even while camping in the middle of nowhere. BushWok© Decadent Camper Cookbook© provides a bevy of sensuous dessert recipes, each dish guaranteed to have you howling at the moon in gustatory ecstasy.